Terry’s Fabrics UK shared my favorite things! 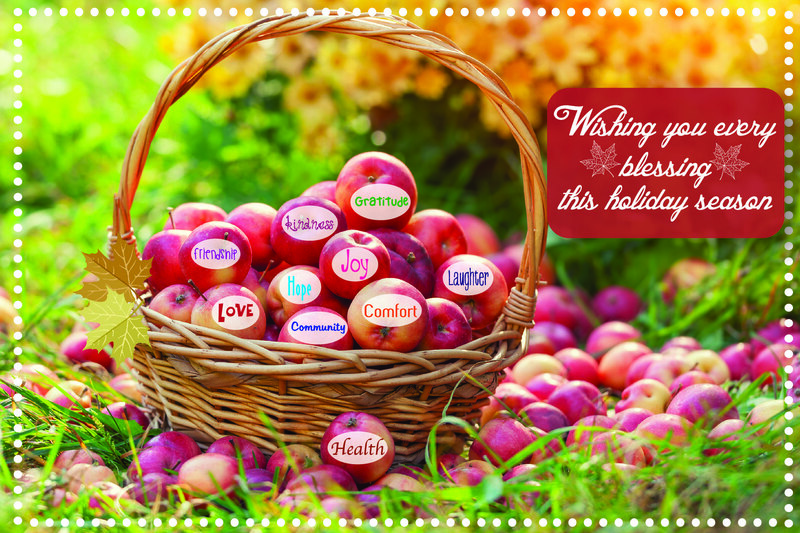 Wishing you an abundance of blessings this holiday season! 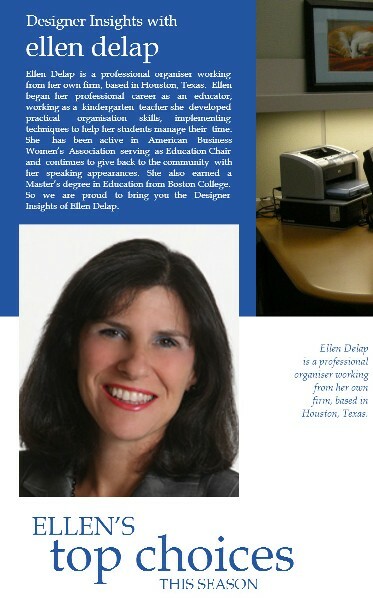 https://professional-organizer.com/WordPress/wp-content/uploads/2016/07/logo.png 0 0 Ellen https://professional-organizer.com/WordPress/wp-content/uploads/2016/07/logo.png Ellen2015-11-26 06:00:002015-11-20 08:17:34Wishing you an Abundance of Blessings! Thanksgiving can be less stress and less mess. It’s all in how you organize your preparation and meal. Here are a few tips on making your day fun, festive and a fuss free Thanksgiving. Make it easy for your and your company to help themselves. Set up a beverage station with ice, your choice of adult and kid beverages, and glasses. If it’s a cool day you may decide on a hot cider with a ladle and mugs too. Place your station in an area that will bring traffic away from the kitchen and into a gathering spot. Take a tip from Ina Garten, Barefoot Contessa, and have a few nibbles out before the main meal. It will keep kids and adults from being underfoot in the kitchen. A plate of fruit and cheese and a bowl or two of nuts is a great starter for the holiday meal. If anyone wanders into the kitchen, put them to work! There’s already a lot to wash and dry, why not go with biodegradable dishware for the day? Available from LeafNFiber, these lovely plates will add to the natural decor of the day and make clean up easy. Make a list of what’s for dinner. After this, create a time line for what goes into the oven at what time. If your list is the same each year, consider creating this in Evernote or a notebook to keep and save. Everyone’s stress level goes down with a soundtrack. Have a guest create a playlist as a back drop for the day. Plan ahead to keep and share leftovers. Purchase inexpensive plastic ware to give away as leftovers leave. Everyone loves this gift! Take a trick from football and other team sports that are on television on Thanksgiving. Get your team in gear. That means everyone has a part to play or a job for dinner, clean up and other activities. There are many small jobs that can be done throughout the day, including ones specifically for your kiddos. Help everyone pitch in by giving everyone something small to do to be a part of the festivities. 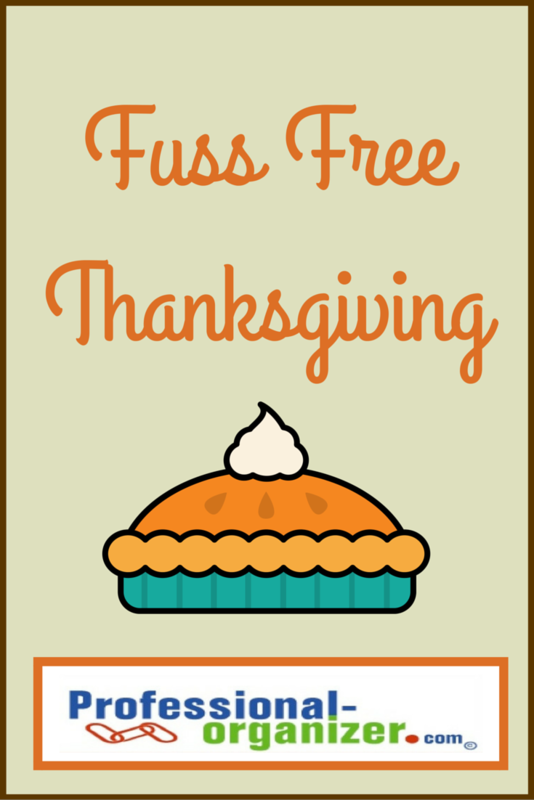 What ways do you make it a fuss free Thanksgiving at your home? Thanksgiving is a one of my favorite holidays! It brings together all that I love! It’s our family sitting together, lingering, chatting and enjoying each other at our dinner table. It’s a food festival with special seasonal treats like noodles, bread dressing and gravy. It’s a day of thankfulness, blessings and mindfulness. 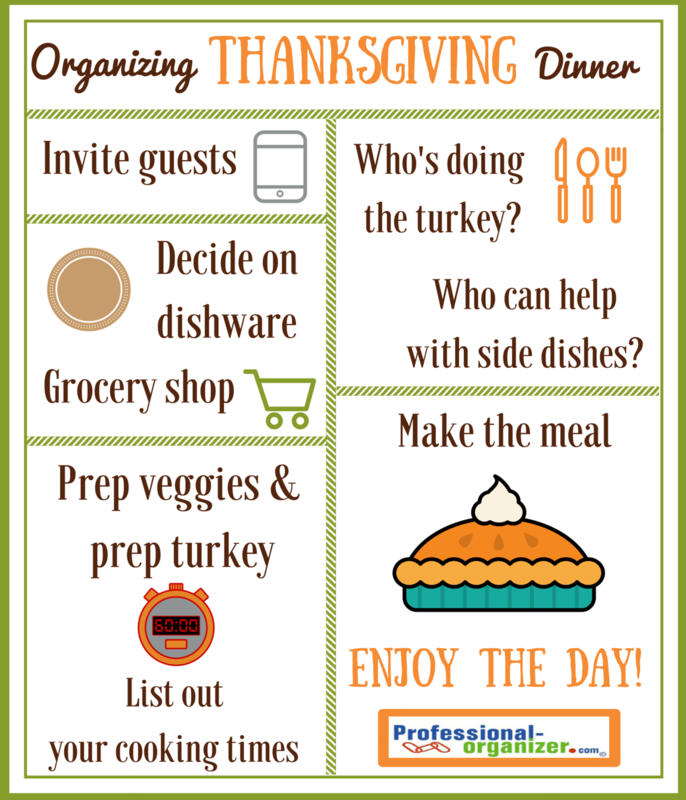 Here are a few tips for Thanksgiving Day Organized. It’s also a day to be especially organized! Make your plans and invite your guests two weeks ahead. Knowing who is coming is a blessing to you and your guests. It’s fun to share the day and share the cooking. Who will bring the turkey? Who will bring what side dishes? Who is bringing the pie? Share the responsibility and also get some help from Mrs. Kroger. There’s a lot of food to buy and veggies to prep. Start early with both of these to be sure you have enough time and energy. Turkeys need time to thaw and cook properly. A great timeline helps you stay organized. Enjoy the day with family friends. A game of charades, snooze on the couch, afternoon walk, or color pages can make for a little extra fun. It’s the little touches that add to a special event and make family memories. What makes your Thanksgiving Dinner organized? What tricks do you use? Join my newsletter for more holiday organizing tips. Pumpkins, black cats and witches are everywhere! It’s the first holiday of the fall season and a prelude to all other fall and winter holidays. According to the National Retail Federation, almost 50% of us decorate for Halloween. 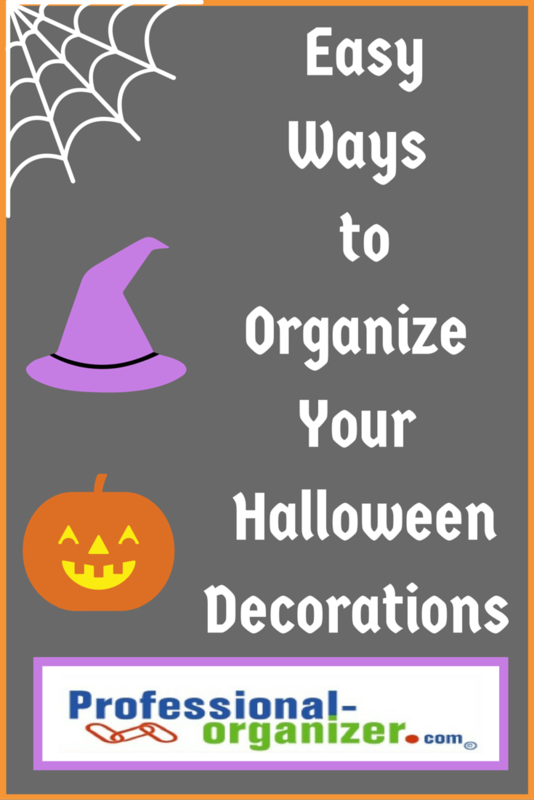 Make it easy to decorate for Halloween with these easy ways to organize your Halloween decorations. Organize your Halloween decorations in orange easy to spot totes. Label the totes on two sides and on top to know exactly what is in each bin. We love those giant inflatable decorations! Store them in individual 18 gallon tubs to keep them in good condition. Pumpkins can be difficult to store because of their generous size. Keep these from crushing with extra large ziplocs. Your pumpkins are all together too. Flameless candles, candle holders and strings of lights can be stored together in a small bin. Wrap the strings of lights in circles then store in gallon size ziplocs. Just like all holidays, it’s best to make a plan for when to decorate and undecorate. Enjoy a fall afternoon outside with your family creating a spooky spot on your front lawn. How do you organize your Halloween decorations? Happy Fall Y’all! Check out the fall fun on my pinterest board.